Fans of Celtic rock, get ready for a treat – one of your favourite bands are back, with a brand-new album! 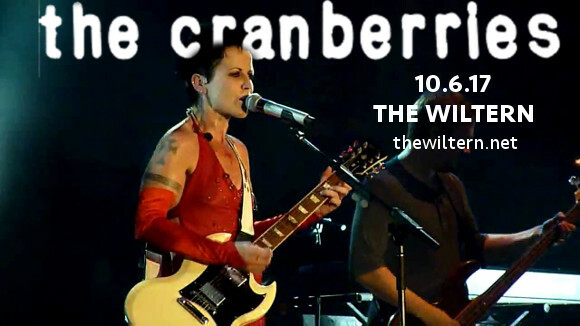 The Wiltern is proud to present The Cranberries on Friday 6th October 2017 on their “Something Else,” tour!! Don’t miss your chance to catch the artists behind “Zombies,” live – it’s going to be an incredible show!! Book your tickets NOW to be sure of your place! Formed in Limerick, Ireland in 1987, The Cranberries are composed of vocalist Dolores O'Riordan, guitarist Noel Hogan, bassist Mike Hogan, and drummer Fergal Lawler. With a sound that mingles alternative rock with jangle pop, post-punk, and traditional Irish music, The Cranberries’ fresh and distinct sound made them an instant sensation with the release of their first album; “ Everybody Else Is Doing It, So Why Can't We?” in 1993. The album peaked at number 1 on the UK charts and is today considered a staple album of the decade. After a string of top charting albums throughout the 90s and hit singles including "Linger", “Dreams", and "Zombie", The Cranberries disbanded. After a 6-year long hiatus, and to the joy of waiting fans, they regrouped in 2009. Now, the Cranberries are on tour with their latest offering; “Something Else,” a reworking and re-imagining of earlier songs in an all new way in collaboration with the Irish Chamber Orchestra. Don’t miss your chance to catch one of the most successful bands of the 90s live – book your tickets to see The Cranberries TODAY! !